WASHINGTON – More than 50 city and county ordinances banning the use of the toxic weed killer glyphosate on local playgrounds, parks and schoolyards could be overturned by a provision championed by House Republicans in their version of the farm bill, an EWG analysis found. A four-page provision tucked away in the 748-page farm bill passed by the House of Representatives in June would likely preempt local governments from adopting their own pesticide regulations, including ordinances that prohibit the use of glyphosate, the active ingredient in Monsanto’s Roundup, in parks and playgrounds. EWG’s analysis of data from Beyond Pesticides found 58 local ordinances that ban the use of glyphosate. Overall, 155 local ordinances that regulate the use of toxic chemicals in parks and playgrounds could be preempted by Sec. 9101 of the House’s farm bill. Glyphosate is classified by the state of California as a chemical known to cause cancer, and as a probable carcinogen by the World Health Organization. Earlier this month, a San Francisco jury ordered Monsanto to pay $289 million to a school groundskeeper who said years of working with Roundup caused his terminal cancer. The analysis comes just weeks after tests commissioned by EWG found potentially unsafe levels of glyphosate residues in popular oat-based foods marketed toward children, including Cheerios. Cities and counties that may no longer be able to ban glyphosate in places where children play include big cities like San Francisco and smaller communities like Evanston, Ill., among many other locations. The section of the farm bill that could block cities and counties from adopting their own pesticide safety standards is opposed by the National League of Cities and the National Association of County Officials. Last week, 107 members of the House sent a letter to the farm bill conferees outlining their opposition to pesticide riders like Section 9101 and the “Poison Our Waters Provision,” which would eliminate Clean Water Act safeguards to protect communities from pesticides sprayed directly into water supplies. Among the companies and industry groups registered to lobby Congress on pesticide provisions of the farm bill is Bayer, which now owns Monsanto, Dow and CropLife America. “Parents and city leaders, not pesticide corporations, should decide whether their kids are playing in pesticides,” Faber said. 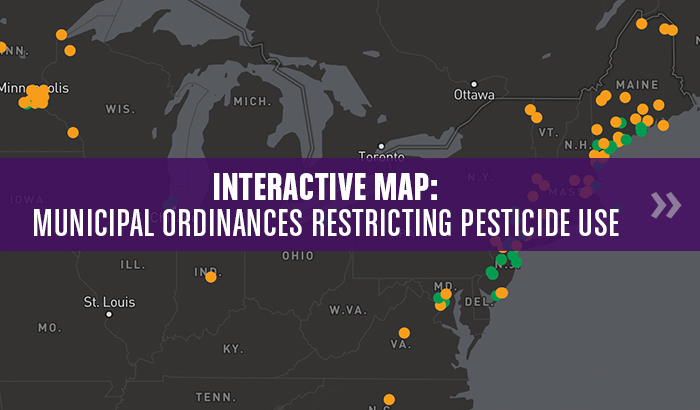 To see all communities with existing pesticide restrictions that could be preempted by the House farm bill, click here.